Seattle — best known for the Space Needle, the Seahawks, and Starbucks — has added a more dubious claim to fame this week: as one of the world’s most polluted cities. Canadian wildfire smoke is sweeping over the northern border, suffocating Puget Sound, Washington State, and beyond. As many readers will know firsthand, smoke is billowing over vast swathes of the western United States. 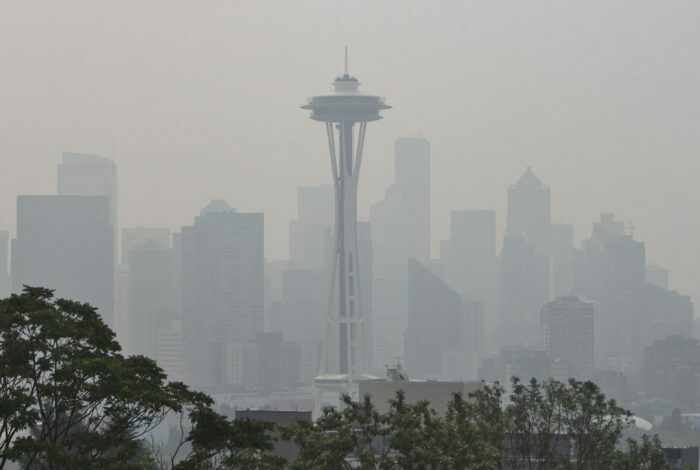 “Things have to come together just wrong to get smoke into the Seattle area,” state Climatologist Dr Nick Bond told WhoWhatWhy. Unusual weather patterns are bringing smoke down to ground level from the fires in British Columbia and from elsewhere in the state. People are taking to social media to complain of itchy eyes, sore throats, and other health problems. Wildfire smoke is part of the new normal & I need to figure out how to make it through August (of every year) without collapsing into a pile of coughing & migraines. Smoke pollution from wildfires has been especially bad for the past two years. No less than 12 states, from Alaska to New Mexico, have reported large fires burning at the moment, according to the National Interagency Fire Center. And winds are carrying the smoke for hundreds of miles, affecting populations far away from the fires themselves. What’s to blame for this uptick in forest fires? Is it all our fault? And does the increasingly rapid climate change predicted by climate scientists mean we can expect smoky summers in the future? With smoke drifting so far, many hundreds of thousands of people are at risk from its effects, even though they are not at risk from the flames. Related: Did Negligence Cause the California Wildfires? Fire usually becomes news when it burns dangerously near highly populated areas, like the deadly “Thomas” fire in Santa Barbara last December. Then we saw images of burning houses and mass evacuations. So why are distant fires that are burning far from towns and cities making news even though they are not threatening buildings? The real danger comes from particles called PM 2.5. They get their name from their size — 2.5 microns — which is far thinner than a single human hair. These microscopic specks are particularly dangerous because they can go deep into the lungs and cause damage, “especially if you have some respiratory problems to begin with,” says Bond. The last two years have seen the highest particulate level in over 20 years and those particles can cause heart attacks and strokes, warns the Puget Sound Clean Air Agency. Higher instances of respiratory and sinus infections have been reported by health officials in many western states. People in affected areas, and in particular those in high risk groups such as the very young and old, are being advised to stay inside and close windows and doors. If going outdoors is unavoidable the advice is to use a face mask and limit strenuous activity to avoid deeply breathing in the particles. While driving, the re-circulate option on the A/C controls will limit the number of smoke particles inside the car. The videos this week show Seattle as a city smothered by smog — similar to pictures of Beijing, where much of the electricity is generated by coal-fired power plants. Or 1990s Los Angeles, blanketed by car emissions. Related front page panorama photo credit: Adapted by WhoWhatWhy from San_Diego skyline (Kat Miner / Wikimedia- CC BY 2.0).